Despite the antics of B.W. This poem was written by the late Bill Heyes who owned narrowboat 'Tinkerbelle' which was the several times winner of the Best Dressed Boat at some of the early Ashton Rallies. 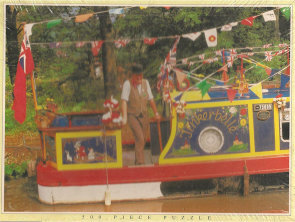 Bill and his boat turned up, much to his surprise, on a rather colourful 500-piece jigsaw. The song was passed on to me by his brother-in-law Gordon Macdonald who added a tune and premiered it at Bollington Folk Club in September 2018. This is the recording which can be heard here. My thanks to Gordon for this.